Maria Mason Oct 1836 in Deane: they had a daughter Hannah Maria but the mother, Maria, died of typhus in Jan 1839 aged 23. Mary [Ann] Alexander nee Wigan Jan 1845 in Wigan: they had five children. Mary was born in 1818 and had married William Alexander in 1837 in Wigan. He died in 1842 leaving one daughter, Margaret Alexander (1842 - 1916). She had married John Grindall Brayton in 1868 in Wigan, a doctor, and they went on to have five children, one of whom was the celebrated actress, Elizabeth 'Lily' Brayton (1876-1953). Lily Brayton was well known to her cousins. Matthew's father , Thomas (1765-1833) was christened in Eccleston with Douglas and was buried in Eccleston. He married Margaret Edgar in 1801 in Bilinge. Thomas was a clockmaker. Thomas's parents were James Barton and Susannah Duerdon. James was born in 1737 in Eccleston and Susannah in Ormskirk in 1741, where they married in 1762. He is recorded as being a tanner. Photo circa 1864 - Back row: Mary Barton nee Wigan, Margaret Alexander, Elizabeth. 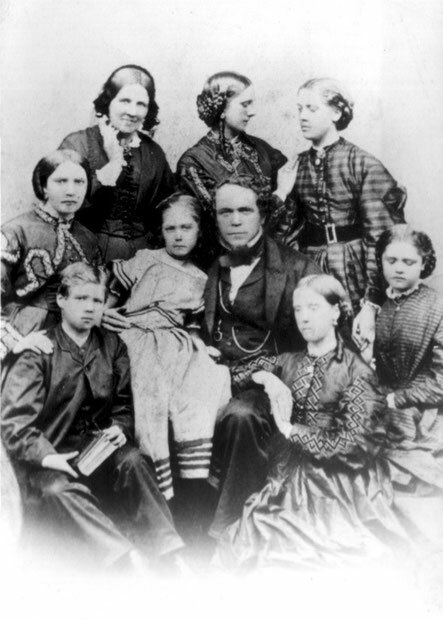 Middle: Hannah Maria, Eva Jane, Matthew, Annie Wigan. Front: Matthew Henry, Mary Dean. On Friday last at his residence – Mere Oaks Villa, Standish – died Mr Matthew Barton, aged 56 years. The deceased who was a prominent Wigan tradesman, and who for several years was a member of the Wigan Corporation, had been in ill-health for some time. The internet too place on Tuesday last, in the family vault at the Parish of All Saints. The Hon. And Rev. G T O Bridgman conducted the service and he was assisted by the Rev LRC Bagot. The mourners were Mr J Barton, Parbold; Mr H Barton; Mr T R Ellis, Dr Brayton, Mr W Lea, Mr G Ormrod, Mr A Ormrod, Mr T Farrimond, Ormskirk; and Dr Price, Standish.